Italian cars have long had the reputation of attracting rust. Even enthusiasts with much amore for these machines will joke, “If you listen closely, you can hear them corroding.” So why would any sane person bring a 1991 Alfa Romeo Spider to the Bonneville Salt Flats? One word: speed. Driving at high speeds is an interesting challenge, as the only goal is to go fast in a straight line. It pits teams against physics, the clock and their own fears. Unlike autocrossing, or even NASCAR racing, there is no turning involved. And unlike drag racing, a land speed racing run can take minutes to finish. It’s a totally unique motorsports experience that has attracted its own legions of dedicated fans. Reaching top speed—or surpassing any other benchmark—is a challenge that seems ingrained in the human psyche. Think back to high school: There was always that one tough kid who bragged about topping 100 mph in his Fiero. “And I didn’t even have the gas all the way to the floor,” he’d add nonchalantly. The problem with triple-digit speed claims is that they’re very hard to back up. A vehicle can take miles to reach its top velocity, and there aren’t many convenient places to conduct that kind of research. 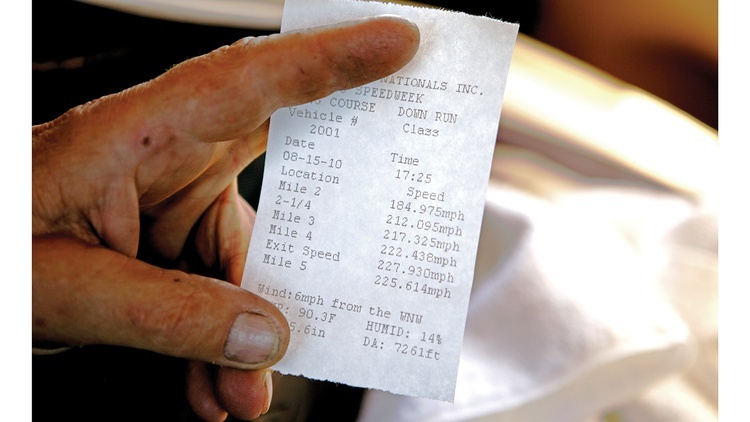 Thankfully, a handful of locations around the country host top-speed competitions for the amateur driver. Some are abandoned airports in the East, but the granddaddy of all land speed racing venues in the U.S. is the Bonneville Salt Flats. In this otherworldly landscape, the smooth, densely packed salt crust promotes some amazing speeds. People have been making land speed attempts at Bonneville Speedway for more than seven decades, and close to 60 years ago the Southern California Timing Association expanded its domain to sponsor competitions in Utah and Nevada. The diversity of the vehicles that show up is equally impressive. 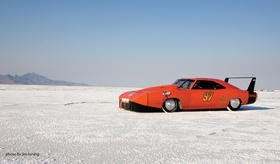 Name a car, and chances are it has braved Bonneville. Sure, the place can be full of hotrods, but it draws trucks, bikes and race cars of all kinds, too. For the last dozen years, Bonneville Speedway has also attracted a small group of Alfisti, based mainly out of Chicago, Illinois, and Dayton, Ohio. Like everyone else on the flats, they arrive to answer that fundamental question: How fast can they go? This trip started way back in 1999, when a few hotrod enthusiasts from the Alfa Romeo Owners Club thought it would be fun to go land speed racing with an Alfa. Richard Kreines found the 1991 Spider, which had been involved in an accident, and dropped it off at Besic Motorsports, where brothers Mike and Darren Besic built the chassis and the original engine. For the most part, the SCTA’s rules regarding car prep are fairly unlimited. If you can dream it, they can classify it. 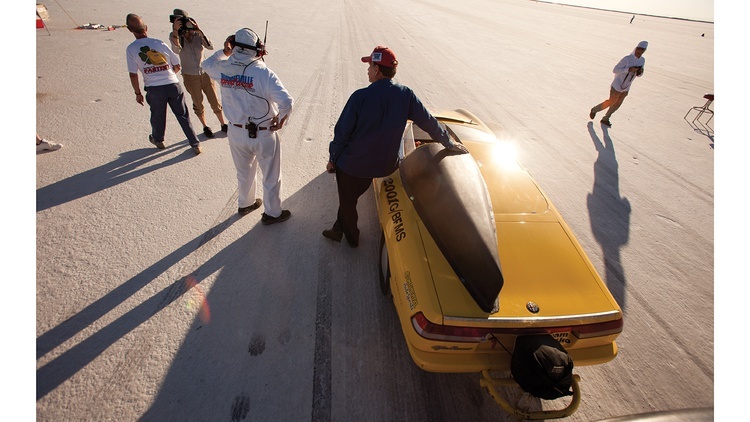 Bonneville is a run-what-you-brung kind of event—except for safety, that is. 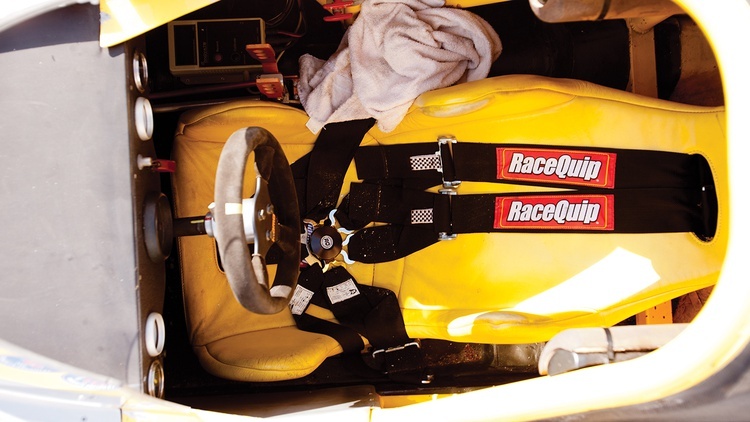 The roll cage requirements are very similar to the NHRA’s. The Alfa, for example, was built with an extensive cage below the waistline. It’s more complex than one you’d see in a typical road race car. For the top, the team took their cues from NHRA Top Fuel cars. It features a six-point cage that cocoon the driver’s head and shoulders, leaving only inches of wiggle room. It’s designed to protect the driver should something go wrong, but it also offers aerodynamic advantages by keeping the amount of tubing above the car to a minimum. Much like a road race car, the Alfa also has a wraparound racing seat. However, to keep the driver out of the airstream as much as possible, the seat is more reclined than the one you’d find in a typical production-based race car—it’s closer to a formula car seat, in fact. Since the driver is reclined so much, the seat is equipped with a seven-point harness, featuring three anti-sub belts. Since the Alfa is an open car, the driver is required to wear both arm- and leg-restraint systems. Add up all the belts, the heavy fire suit, thick gloves, HANS Device and other safe but bulky items, and getting strapped into the Alfa quickly becomes a team sport. Once you’ve got the safety gear covered, the vehicle regulations at Bonneville become as wide-open as the terrain. The SCTA offers 18 different classes for fuel-powered cars with internal-combustion engines, from the ancient XXO class for flat-head, four-cylinder Fords to the unlimited-displacement AA class. 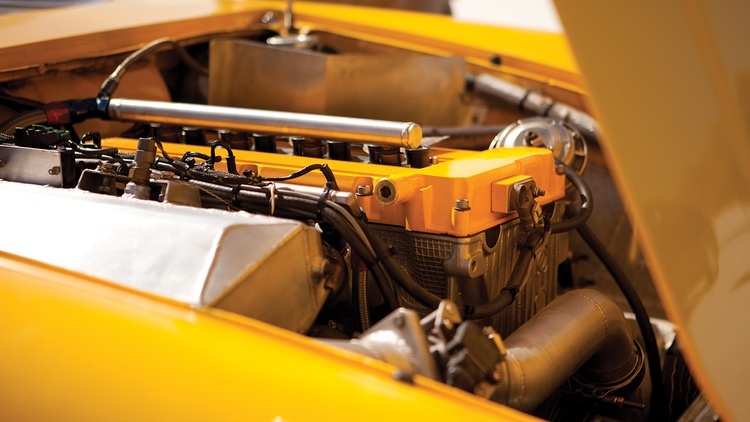 On top of that, you get to choose a flavor of engine: blown or unblown? Then, you can decide between fuel (any fuel for spark-ignited engines), gas (spec gasoline) and diesel. Finally, you’ve got your pick of car types—everything from stock production cars to purpose-built streamliners. If you do the math, well, there are lots of choices for running down the Salt Flats. 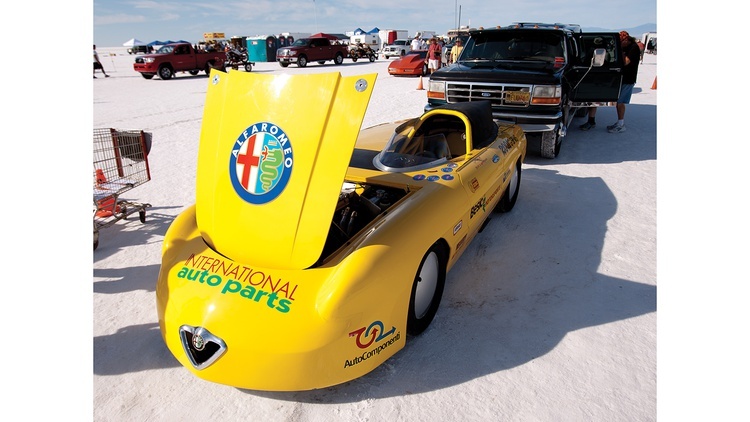 Since its first Bonneville appearance, Richard’s Alfa has sported four different engine setups. The first one, a 1600cc Alfa engine shrunk to fit the 1500cc class, ran in 1999. 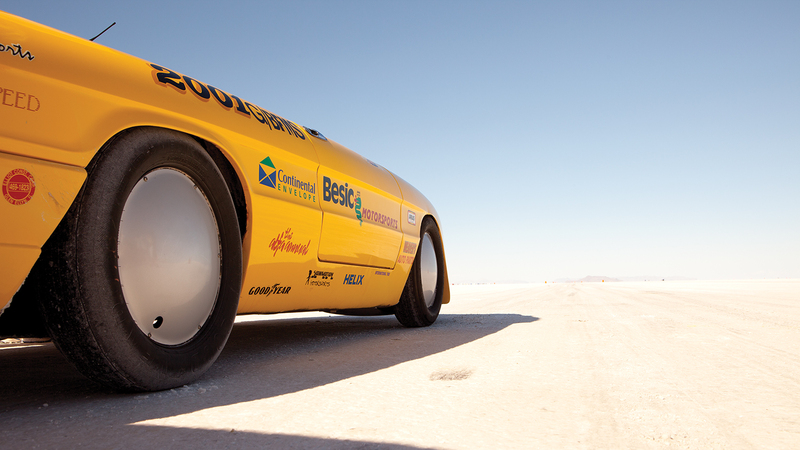 A roots-style supercharger topped the engine; in this configuration, the vehicle set the H/BMS record at 152 mph—until someone beat it later in the week. The Spider’s second race powerplant, a 2.0-liter Alfa engine fed by a belt-drive supercharger, never made it out to the salt. The blower failed not once, but twice, on the dyno. Soon after the second failure, the team prepared a Garret turbo setup for a 2001 effort. Between 2001 and 2002, the Alfa’s top speed increased from 192 mph to 203 mph, handing the team the G/BFMS record. Then that engine blew up in a spectacular manner, leaving only one cylinder intact to confirm displacement. One of the beauties of Bonneville is that teams can jump between classes—and record attempts—by changing engines. While the Alfa team was developing their current engine, the Spider made one appearance with a normally aspirated powerplant sourced from a European-spec Alfa Romeo Milano sedan. A non-turbo setup didn’t mean the car was slow, though. With relatively little development, it set two records in 2004: the G/FMS title of 159.112 mph for Mike Besic and a G/GMS record of 162.859 mph for Craig Bilat. The latest setup, though, is a monster. Its twin-spark, 2.0-liter block comes from an Alfa Romeo 155, the company’s upmarket sedan sold during the mid-’90s. While the 155 never came stateside—remember, the marque officially left our shores in the middle of the decade—the model left a legacy in European touring car racing. The high points of the recipe include a massive Holoset turbo, water intercooling, and as open an exhaust as possible. Boosting a relatively small engine to make 500 horsepower is not easy, and the task is only complicated by Bonneville’s air quality. Between the temperature and the altitude, the conditions at the salt flats are equivalent to those at more than 7000 feet above sea level. This climate can wreak havoc on engine structure. On the Alfa, the open deck design and slip-in liners lead to structural instability. Jim Steck’s company, Autocomponenti, builds the team’s engines and had a solution: a custom sleeve machined from a solid billet of aluminum. Filling in the spaces around the tops of the cylinders both stabilizes and strengthens the block. But that’s not the only problem with very, very high combustion pressures. Much like the GM Ecotec, the Alfa’s cylinder head isn’t strong enough to prevent deflection. The team’s fix for this issue: replacing the traditional head gasket with a set of high-pressure, gas-filled metal O-rings. Now most of the intake pressure remains inside the combustion chamber. Then there’s the boost from the turbo. While conventional wisdom says you can just spin the turbo harder to make more boost, Bonneville Speedway’s altitude adds another variable. When the team wants to tune the engine to 500 horsepower back in Dayton, they need 29.4 psi of boost. The ambient air pressure in their hometown is 14.7 psi, so that’s a pressure ratio of about 2:1. Many large turbos can manage that amount of pressure fairly easily. To achieve that same 500 horsepower in Bonneville—where the average ambient air pressure drops to 10 psi—the team still needs to generate 29 psi. As a result, the turbo must now operate at a 3:1 pressure ratio. The turbocharger setup just became way more critical. Another trick item on the car is the cooling system. While a radiator is required, it’s not the Alfa’s primary cooling source. Water has an amazing ability to absorb and store heat, and the team uses it to their advantage with a large water tank they installed in the trunk. The water adds a lot of weight, but that’s not a terrible thing. For one, weight doesn’t affect top speed. Second, the extra pounds in the rear actually help keep the car planted during its runs. Then there’s the cooling of the intake charge, a job handled by an air-to-water intercooler. The team decided on a setup that further improves traction with its heft and doesn’t obstruct the airstream: They replaced the passenger seat with a cooler full of ice water. The team has learned many lessons about the engine over the years, too. They spent one Speed Week trying to figure out why the engine kept overheating in a flash—the temperature gauge would rise faster than the tach. The culprit was a slipping water pump belt. Here’s something you may remember from high school physics: The maximum velocity of an object is a balance of drag and driving force. If you were really paying attention in class, you may recall the way to calculate how quickly an object can fall. Driving as fast as you can is no different: You stop going faster when the power the engine makes equals the power that’s pushing back due to wheel and aerodynamic drag. That aero drag is one of the toughest challenges in land speed competition. Again, the SCTA welcomes a pretty wide assortment of body styles, from unmodified production cars to closed-wheel streamliners. More than 20 total bodies, including full-sized trucks, have a place to play. The team chose to enter their open Alfa in the Modified Sport body class. That means they can outfit the car with a full belly pan as well as remove the entire top of the car, much like drag racers can do with their Funny Cars. Also, this class permits lengthening the body in front of the engine bulkhead. The Alfa Romeo Spider can date its original shape back to 1966 for production—earlier for a Geneva prototype. It’s a simple yet elegant design, with a classic Italian fascia and a nicely rounded rear end. In 1970, that body was changed to have a square rear end. In fact, it has since become the trademark tail for the model. For land speed racing, this body shape is extremely easy to work with. Draw a line from the rear of the hood all the way to the tail of the car—ignore the glass and interior, of course—and you’ll find that it’s almost perfectly level. Even the rake of the hood is fairly flat. The Alfa also has a very low body, meaning little drag and not much frontal area. The team capitalized on these basics by removing the windshield and covering most of the passenger area with an aluminum tonneau cover. Since the car’s Bonneville debut in 1999, the body has had three nose jobs, finally resulting in one that sports a single triangular opening for the late-model Alfa Romeo 156 grille. 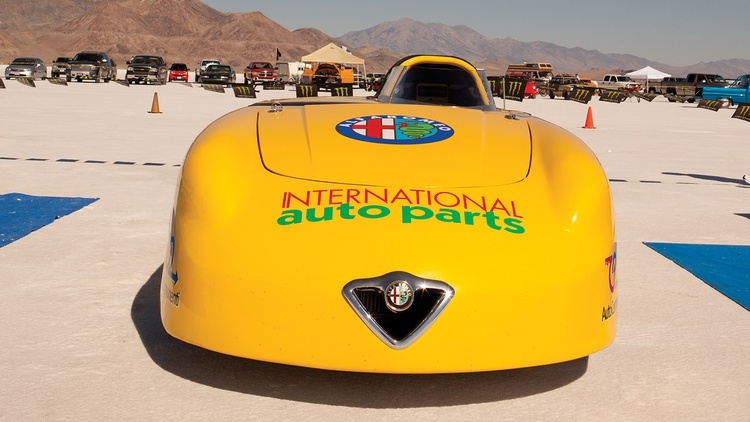 During their first few events at the Salt Flats, the team left the underside of the Alfa exposed—and it negatively impacted performance. The car returned in 2003 with a full belly pan, featuring blisters for both the front A-arm and the rear differential. Thanks to the armored undercarriage, top speed jumped by almost 10 mph and all the drivers reported that the car was a whole lot easier to drive. Plus, the Alfa can now sit taller than many other cars that take on the Salt Flats. In fact, the ride height and a slight upturn at the tail generate a moderate amount of downforce via a tunnel effect. Unlike most other teams in the Modified Sport class, the Alfa gang resisted lengthening their car’s body for the longest time. While a stretched car would have been faster, the expense was hard to justify. Plus, as the team notes, the car looks fantastic with the stock proportions. They also get great pleasure from those who don’t believe a car this short can go so fast. So, how fast is this thing? For a solid decade, the Alfa was an honest 200 mph bullet. Then it got really fast. In 2006, it finally broke the G/BGMS record by reaching 217.157 mph. After a few troubling years—bad salt, rained-out events—the team had an even better showing in 2009. Despite a clutch issue, Jim Steck set the G/BGMS record of 230 mph with a trap speed of 234 mph. The next year, Bill Lightfoot raised the G/BFMS record to 232 mph. Just pause for a moment to appreciate how fast that is. Those figures come with an interesting footnote: The team’s research indicates this is the fastest Alfa Romeo ever built. The Alfa Romeo Indy cars campaigned during the ’80s and ’90s never cleared 230 for an extensive stretch of time, and the factory’s Le Mans racers of yore didn’t come close. Then, bad followed good: A cracked cylinder head in 2011 potentially signaled the end of this program. But the salt has a funny way of getting into your veins, and the Alfa effort lives on. Shortly after arriving home from the abbreviated week, the team made plans for an extensive rebuild. Their hypothesis is that the engine’s combustion chambers are flexing outward due to the high combustion pressures. A problem like that could distort the works and significantly compromise the seal between the top of the engine block and the bottom of the cylinder head. Thanks to info gleaned from GM’s Ecotec land speed record attempts, the Alfa team believes they can force the combustion chambers to stay in place by inserting set screws through the cylinder head. Then there’s the planned bodywork. The wheelbase will finally be stretched, adding 24 inches of stability to the package. 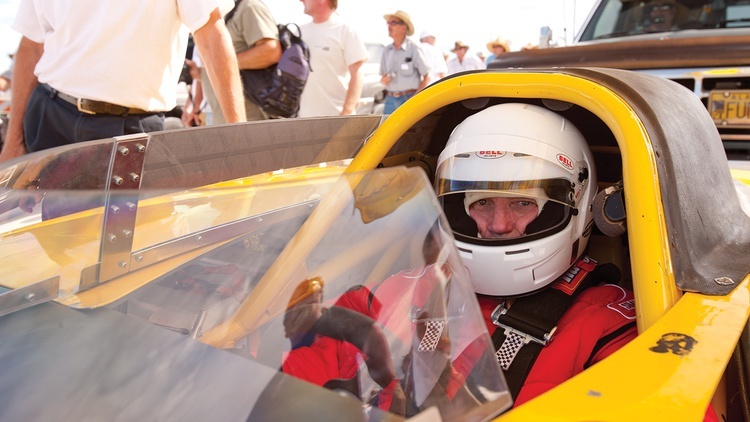 Land speed racing can be a car enthusiast’s dream as well as an incredibly challenging reality. The only opponent is physics—how much power you can make, and how much drag you can reduce. Judging by the fields seen at Bonneville each year, the salt’s siren song appears to be one of the loudest in all of motorsports. What’s it like to drive at 230 mph? It depends on the conditions. The salt surface is different from year to year—and even from morning to afternoon as the sun dries any moisture. The flats are covered in water every winter from rain, melted snow and run-off from the surrounding mountains. The water evaporates soon after the spring storms end, but high winds during that period can leave a bumpy surface. If that happens, SCTA officials grade the terrain as well as they can, but even their best efforts can only produce a surface that feels like hard-packed snow. Traction is limited, visibility is reduced from the rough raceway, and keeping the car pointed in the right direction becomes a constant battle. Thankfully, we’ve encountered conditions that bad only once in the time we’ve been running at Bonneville. Most years the surface is concrete-flat, but the traction is never as good as on pavement—full throttle will result in wheel spin until top gear. There may be an occasional soft spot in the salt that will turn the car slightly due to difference in traction from one side to the other. Corrections need to be made quickly, but they must be small. The other challenge is the crosswind. The prevailing wind blows over the mountains and varies along the length of the course. Riding a bike in this environment could be exciting. Over the years, we’ve made a few modifications to the car so that it’s easier to drive. Slowing the steering ratio has made it much easier to make small corrections. The first couple of years, the driver was constantly chasing the car to keep it within the 100-foot-wide course. The other improvements are aerodynamic. Adding the headrest fairing has moved the center of pressure rearward, acting like the fletching on a dart, and the belly pan and rake angle on the car provide a modest amount of downforce. Since first gear at redline will take the car to 120 mph, a run starts with a push start. The truck keeps accelerating until the car can pull away on its own—at about 45 mph. From there, it’s a matter of modulating the throttle to control wheel spin. Shift into second, then third, adding a little more throttle each time—too much and the car gets a little sideways, but that’s when you really feel the speed. When you finally shift into fourth, the throttle should be all the way down. Acceleration is still good; just concentrate on keeping the car on-course, and start looking for the mile markers. They go by every 15 to 16 seconds. After mile five, push in the clutch, shift the transmission into neutral, straighten the car slightly because you drifted while driving with one hand, then pull the handle for the chute. If there’s a crosswind, the chute will pull the back of the car a little sideways when it hits, causing it to oscillate from left to right. That soon fades away as the speed decreases, and you start looking for the turnoff to the return road. The shut down area is two miles long, so there’s plenty of room—no need for brakes, just coast off the course so the next driver can go. To be clear about the article, the driving at speed part was a side bar written my the driver/engineer/fabricator Jim Steck. So you know. And to repeat something I've been posting for about 15 years- Bonneville should be on everyone's bucket list. Even for just a day. And pay for the pit pass to walk around.